Baalberith were an Australian Black Metal outfit who formed in the mid 90´s with a sound reminiscent of the first Emperor MLP, early Burzum etc. The band had four releases during their existence "Darkest Come… The Empire Shall Ride" demo (1995), "Storming through the Gate of Knowledge" album (1997), "At the Gates of Hell" demo (2000) and "Drightenlands" on a split with Blodarv [Denmark] (2002). Bolthorn the motivation behind Baalberith went on to form war metal band "Urgrund", who are mentioned to have performed a Baalberith song live at least once. Baalberith were however a studio-only band. 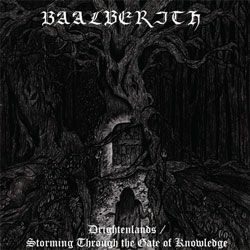 This release is a compilation of "Drightenlands" from the split and the "Storming through the Gate of Knowledge" both remastered for this release.